THE ENTRANCE FEE OF THE MARTYRDOM OF SANT'ORSOLA COSTS € 4 PER PERSON AND IT IS NOT INCLUDED. THE ENTRANCE FEE OF THE GEROLAMINI GALLERY COSTS € 3 PER PERSON AND IT IS NOT INCLUDED. 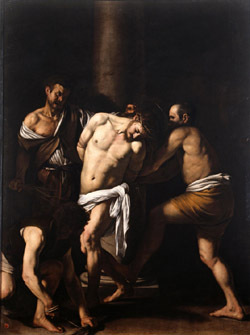 On May 28, 1606, the painter Michelangelo Merisi da Caravaggio stabbed another man, Ranuccio Tomassoni, during a brawl during a tennis match in Rome. 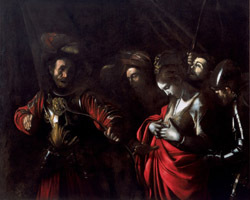 Tomassoni was killed and the wounded Caravaggio received a death sentence, which could be carried out at any time by anyone. The already famous painter fled Rome for his life, beginning his travels through southern Italy and Malta, which were to alter his painting style and shape the history of Western art. He died in 1610 at the age of 38 during a desperate attempt to return to Rome. 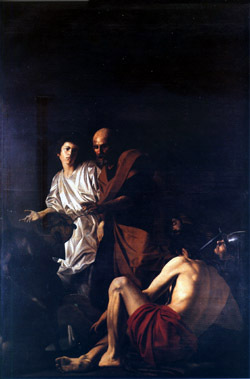 Caravaggio's brief stay in Naples produced a notable school of Neapolitan Caravaggisti, including Battistello Caracciolo and Carlo Sellitto. 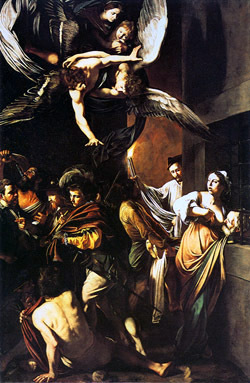 The Caravaggisti movement there ended with a terrible outbreak of plague in 1656, but the Spanish connection – Naples was a possession of Spain – was instrumental in forming the important Spanish branch of his influence. In 1606, when Caravaggio arrived for the first time in Naples, this city was one of Europe's largest and wealthiest - cosmopolitan and international, its people possessed a fierce individualism that remains to this day. Its population was three times that of Rome and was continuing to grow. This particular situation attracted many artists who were committed here easily. When Caravaggio arrived, he found a generation of "Neapolitan" painters who learned quickly and interpreted each one in different ways his painting. ENTRANCE FEE FOR THE BANCO DI NAPOLI AND FOR THE GEROLAMINI GALLERY ARE NOT INCLUDED.